You are often concerned about money, although planet Neptune can make you feel as though you have just enough to get by comfortably. 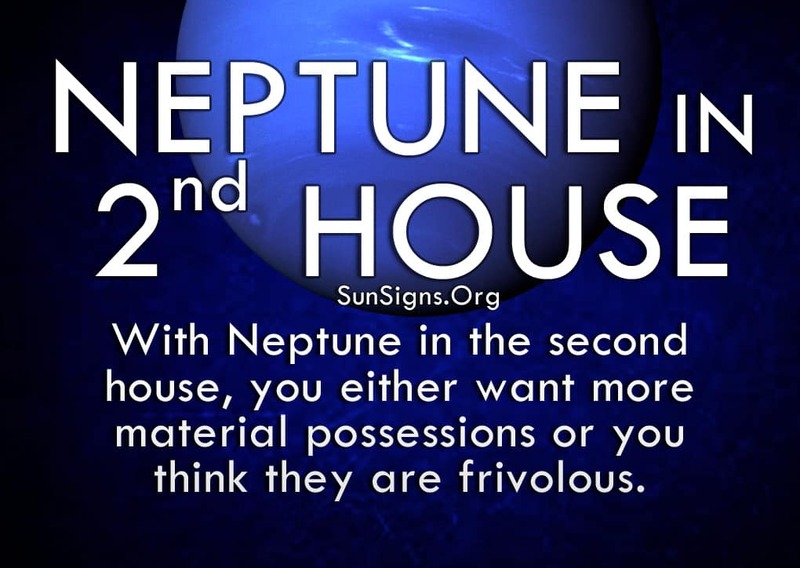 In the second house, you either want more material possessions or you think they are frivolous. Either way, your beliefs toward wealth are highly impacted by Neptune’s influence. Neptune in astrology represents psychic powers, imagination and stability. The second house usually relies more on logic and reasoning to get anywhere. Because of this, Neptune plays tricks on your attitude towards money and your career. Often times you prefer a job in more artistic endeavors, but these don’t pay a great salary. That means you either don’t care about the money and can live on a modest income, or you’re always hoping something better will come along and help you out. With Neptune in the second house, you have wonderful ideas and a great aesthetic eye for beautiful things, which makes you see the world in a certain way. People are amazed by your visions and want them to succeed as much as you do. It’s all about believing in your capacity to do great things, and that doesn’t have to start with other people validating your efforts. The planets in houses reading for Neptune in 2nd house suggests that if you have a goal in mind, you have the ability to work hard and make it happen. Don’t let anyone tell you your dreams are impossible or worthless. And if you want to volunteer for something you feel strongly about, then don’t let others dissuade you from doing so. Putting your time and energy toward something you love is always a good thing, regardless of whether or not it makes money. It’s all about being happy, so figure out what that is for you. If you have Neptune in 2nd house in your natal chart, be careful not to rely too much on your intuition when it comes to making money. Just because you have grand ideas on how to bring in more wealth doesn’t mean they will work out the way you want them to. Make sure to do the research necessary to ensure your schemes are efficient and effective. You can’t live on hopes and dreams alone, no matter how hard you try. If you feel you have enough money to live how you want, be careful that this doesn’t color your views toward making money. Some people believe the universe will always provide for them if they keep up a positive attitude, but you have to work for what you want just the same. And if you feel you’re being slighted, this can cause the same problem in that you’re not taking responsibility for your financial situation. You may be mismanaging your wealth and making poor decisions without understanding what they are. With Neptune in 2nd house, always look for solid financial advice from those who have their bank accounts in good standing. Things like retirement savings and investments don’t interest you, but they are necessary in building a secure nest egg for the future. Don’t run from reality in this regard, embrace it and see how far you can take yourself and your family. This is natural as Taurus is your ruling star sign. Re-evaluate what you do for a living and see if there is a better way to make money while still utilizing your skill set. While you may enjoy your work, you also have to look at the potential for doing more. Put more confidence in your psychic abilities and you may be surprised at what you find.